Re: What's the SS4 multiplier? shadowfox87 wrote: AxB was already considered illogical more than 9 years ago when those multipliers were first released in the Super Exciting Guide. It was interpreted that it may not literally mean multiplication. Rather, it would be (A+B) x C where C is unknown. C determines how strong the fusion is and that is dependent on many factors such as physical characteristics, type of fusion, etc. "Illogical" or not, that interpretation must come from an official source then. Otherwise there will not be any reason to think that the multiplier works differently, the official statement is clearly saying that it is "A x B" without any indication of any sort of thing being different as far as I could see. shadowfox87 wrote: Tens and dozens are definitely not synonyms literally as they are defined differently mathematically. Tens are multiples of 10s while dozens are multiples of 12s. Tens would include 10-90 as reaching 100 would count as hundreds. The point here is that it is a range and that multiplier depends on the fusees. I see. But how does that prove that Gogeta is, according to you, only 10x stronger than Super Saiyan 4 Goku? Grimlock wrote: "Illogical" or not, that interpretation must come from an official source then. Otherwise there will not be any reason to think that the multiplier works differently, the official statement is clearly saying that it is "A x B" without any indication of any sort of thing being different as far as I could see. Hence in order to satisfy that Base Vegito > SSJ3 Goku, C>200. This is "hundreds" of times stronger than the sum of the individual parts, which is more than "tens" of times. We are all waiting for the manga to clear up Kefla and see if Vados says the same thing or if she will say something different. If Potara is confirmed to be truly multiplication of the individual parts, then multipliers for SSG would sky rocket. Grimlock wrote: I see. But how does that prove that Gogeta is, according to you, only 10x stronger than Super Saiyan 4 Goku? It does "prove" that it is 10x, it "proves" that SSJ4 Gogeta is "tens" of times stronger than SSJ4 Goku which means anywhere from 10-90. Dozens of times means 12-96. That is in the formula, (A+B)xC, C =10 - 90 and this depends on many factors like whether the fusion dance was done properly, the physical characteristics of the fusees and how similar they are. In my sig, you can read the details under "log power scale", but the point is that we don't know exactly, we only know a range. 90 is the max. By logic, SSJ4 cannot be more than 100x a Golden Oozaru because that would be greater than fusion, so SSJ4=10x Golden Oozaru is a reasonable guess, which means 5000x base. 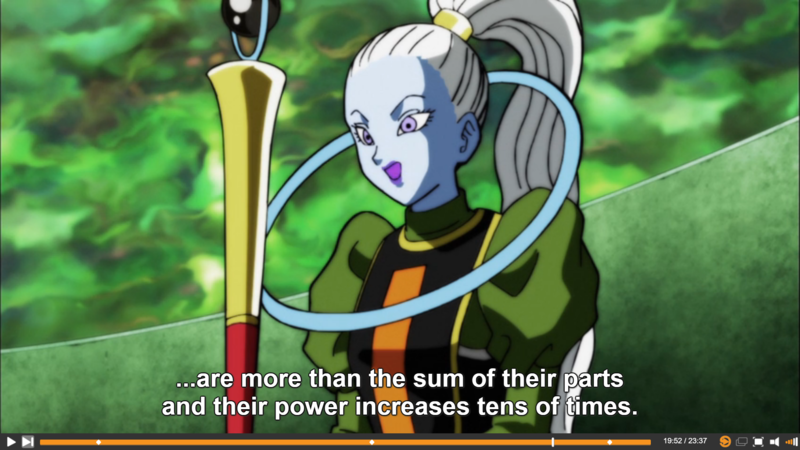 To be fair, as established by Gowasu, when somebody in Dragon Ball says "tens of times" it could still refer to 100x or more. Gowasu said that Base->SSJ2 Goku was an increase of "tens of times" when we all know it is an 100x increase. Of course, in DBZ potara was established to be a much larger boost than just tens of times or anything like that. There is absolutely no way that in the Buu arc SSJ Goku->SSJ Vegetto isn't at bare minimum a 1,000x increase. If you use the anime where Base Vegetto>>Buuhan then it would have to be something like a 10,000x increase for it to make sense. So I mean I guess what I am saying is that this potara increase and even the phrase "tens of times" aren't as clear cut as we thought. PFM18 wrote: To be fair, as established by Gowasu, when somebody in Dragon Ball says "tens of times" it could still refer to 100x or more. Gowasu said that Base->SSJ2 Goku was an increase of "tens of times" when we all know it is an 100x increase. Of course, in DBZ potara was established to be a much larger boost than just tens of times or anything like that. There is absolutely no way that in the Buu arc SSJ Goku->SSJ Vegetto isn't at bare minimum a 1,000x increase. If you use the anime where Base Vegetto>>Buuhan then it would have to be something like a 10,000x increase for it to make sense. So I mean I guess what I am saying is that this potara increase and even the phrase "tens of times" aren't as clear cut as we thought. SSJ Vegito > Buuhan > Base Vegito > SSJ3 Goku. I also don't like to use "tens" of times. I'd rather use math and constraints we know are confirmed to calculate multipliers. But you were using tens of times in your previous post? I'm pretty sure the same is said in Super Exciting Guide: "More than just sum, their power is multiplied" or something like that. Vados' line here would just reiterate what has already been established. I think I recall Herms saying something about it too back in the day. shadowfox87 wrote: It does "prove" that it is 10x, it "proves" that SSJ4 Gogeta is "tens" of times stronger than SSJ4 Goku which means anywhere from 10-90. Never heard about it. Any source for that? Rildo only said that Goku wasn't even using half if his power before he went SSJ. It doesn't mean SSJ is x2. And Goku still has SSJ2 and SSJ3 so it wasn't his full power either. as you want, but remains that a gt scaling cant siply be correct using ssj =x50 , beause super baby 1 > super vegetto buu saga , thing that he says himself and Goku confirms. considering that, we know that , at tha point, base Goku >> buuhan. Grimlock wrote: I'm pretty sure the same is said in Super Exciting Guide: "More than just sum, their power is multiplied" or something like that. Vados' line here would just reiterate what has already been established. I think I recall Herms saying something about it too back in the day. Yes, "tens" of times means it can be anywhere form 10 to 90. So when I mean 10x, I mean C=10. You have to realize that the formula is (A+B)xC where C is 10-90. Hence, when C=10, it's (base+base)x10 = 20xbase. Therefore, Gogeta can be anywhere from 20-180x stronger than Goku or Vegeta alone. If a perfect fusion with no mistakes and matched power levels, and the fusees are twins, it would make C=90. Goku and Vegeta still have some differences, so I would pick C=50, which would make Gogeta 100x stronger. PFM18 wrote: But you were using tens of times in your previous post? Yes, because that's all I got to work with for now. I'm waiting for the manga to give me some more information once Kefla is revealed. Last edited by shadowfox87 on Sun May 13, 2018 10:51 am, edited 1 time in total. shadowfox87 wrote: There is nothing in the SEG that says "more than just sum." It does not even say the word, "multiplied". It says "Goku x Vegeta = Vegetto", which can mean many things. It also appears here in the very website. This is just what Vados said "rather than sum, their power is multiplied" using similar words. shadowfox87 wrote: Yes, "tens" of times means it can be anywhere form 10 to 90. So when I mean 10x, I mean C=10. You have to realize that the formula is (A+B)xC where C is 10-90. Hence, when C=10, it's (base+base)x10 = 20xbase. Therefore, Gogeta can be anywhere from 20-180x stronger than Goku or Vegeta alone. If a perfect fusion with no mistakes and matched power levels, and the fusees are twins, it would make C=90. Goku and Vegeta still have some differences, so I would pick C=50, which would make Gogeta 100x stronger. Grimlock wrote: I think I understand what you mean now. C > 4 (Remember that C=10 - 90), so it already satisfies this condition even with the lowest value of C=10. If the fusees are twins with equal battle power then C=90. Multiplying powers together os mathematically impossible and irrational. The "power" number we use is completely arbitrary and just a way to quantify the ppwers and compare them to each other. So multiplying them together could yield dramatically different results depending on what you are using to quantify the powers. This "add their sums multiplied several times" or whatever makes more sense even if it is drastically lowballing Buu Arc Vegetto. It's however strong it needs to be to make everyone else look weaker than it, until some new form is directly stated to be stronger than it. That's my headcanon for all transformations. Besides, multipliers should be treated as nothing more than how much stronger it puts it over the base, not the maximum possible power of that form. Especially considering further Super Saiyan transformations are meant to be attempts to more efficiently pull more power from the first one. IMO, going Super Saiyan is essentially reaching a new "base" form, hence why Goku's base may be weaker than final form Freeza's even at EoZ but SSJ1 with no god ki could potentially rival Super Vegetto. Just like how Goku's base has a variable power level, so do all the other transformations. Follow chaotic and extraordinary procrastination in the development of Enekai of Kollidor here! what if SS4 has the exact same multiplier as Golden Oozaru? Oozaru is berserker form, with a relatively fixed power-level. But SS4, being a controlled form, would be MUCH more effective while having the same base-level. Also, being the maximum transformation possible for a Saiyan body(as it combines Oozaru, Super Saiyan and a clear mind), ki manipulations that would otherwise cause further transformations don't have any effect on the outward appearance. This would also fit wit the whole "Super Saiyan is the best transformation, and could reach SS3 with due training" stated. For the x10 Kamehameha, I always headcanoned it as a "Kaiohken limited to the Kamehameha"
For the second image shadowfox87 posted: it's in Italian, and from the context I can affirm it's not using mathematical scope. Specifically: "his power is some dozen times more gigantic than a normal SS4". In Italian both "dozen times" and "tens of times" are used as synonym for "lottsa times", when take outside a purely mathematical scope. So, yeah. It's just saying Gogeta is hella strong.